Get to Solingen main Station by Intercity via e. g. Dortmund, Cologne, Hamburg or Düsseldorf. Take an urban railway "S7" here to "Solingen Mitte". Then take a bus line 683 to "Burger Bahnhof". From here it's 15 minutes to walk. Motorway A 1, take the exit no. 96 "Wermelskirchen". Follow the signposts to "Schloss Burg". Parking grounds are available directly at the castle or alternatively at the funicular in "Unterburg". From here take the funicular to the castle. From the "Solingen Mitte" station take a bus line 683 to "Burger Bahnhof". From here it's 15 minutes to walk. The funicular (chairlift) from Unterburg to Oberburg (where the castle is located) is an amazing experience. You are crossing the river Wupper and have an astonishing view to the environment. Burg Castle is one of the parent castles of the dukes and counts of Berg, and it's the largest reconstructed castle complex in North Rhine-Westphalia. It's located in the Solingen district Burg an der Wupper. The castle was built in the first third of the 12th century by count "Adolf II. von Berg" on a hill above the river Wupper. Its name "Castle Burg" it received in the 15th century. It was the main residence of the dukes and counts of Berg until 1385, as Düsseldorf became the new capital of the duchy of Berg. Later on it was used as a hunting lodge and as a place for ceremonial purposes. After the ´dreizigjähriger Krieg´ (Thirty Years' of War), in 1648, the castle got completely destroyed. 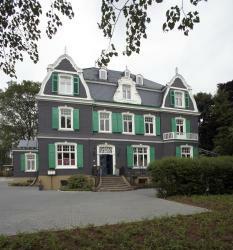 After a partial rebuild it was used as an industrial building (textile industry) up to the middle of the 19th century. Between 1890 and 1914 the entire castle was rebuilt according to historical plans and drawings. Nowadays the castle is a drawing card: more than 250,000 visitors are coming here annually. There is a large museum, the 'Bergisches Museum', which exhibits the important historical circumstances in this castle. There are four chambers: the knights' chamber, the ancestors' chamber, the bower and the chapel. Numerous mural paintings are describing magnificently the former life of the counts and dukes. The knights' chamber was the most important reception hall. All important visitors – monarchs as well as bishops and other clerical leaders – were received here. It was entrance hall, dominion chamber, meeting place and most likely court of law as well. During the tour through the castle the visitors will see the music chamber, different sleeping rooms, the kitchen and a cobbler chamber. In another part of the castle the museum exhibits a large site of model railroads. More than 200 meters of rails with approx. 80 deflectors and more than 100 trains can be viewed here. A very special highlight is the way to get up to the castle: a funicular is available, starting at Unterburg (transscription: lower castle) and ending at Oberburg (transscription: upper castle) which is the castle itself. The funicular is 250 meters long and shows a difference in altitude of 90 meters. Especially during the summer months, when the weather is fine, this funicular is accepted well, as it's a chair lift (and hence not really meaningful when it's raining). "Bergische Kaffeetafel" (a proper translation isn't possible) is a speciality which is available in many restaurants in this area. It contains coffee (of course) as well as waffles (frequently with hot cherries and whipped cream – sometimes with rice pudding), barm brack, brown bread, butter, cheese, liverwurst, blood sausage, smoked ham, honey and finally a schnapps. There is a handful of events occurring annually at the castle. Around easter the easter market takes place: a rich supply of decoration, gifts, springlike floral arrangements and way more. During the medieval market the visitors can look over the shoulders of medieval craftworkers or have fun during the medieval tournaments. In the Advent season there is a large christmas market with christmassy decorations, gifts and way more. "Bergisches Land" – the region is a perfect hiking area. Two long distance hiking trails (the "Bergischer Weg" from Essen to Königswinter and the "Bergischer Panoramasteig", a loop trail with 224 km and astonishing panoramas) and many short distance hiking trails are available. The trails show all levels of difficulty, hence everybody (beginners as well as experienced hikers) find "their personal track". The Müngstener Brücke (Müngsten bridge, formerly "Kaiser-Wilhelm-Bridge") is the highest railroad bridge in Germany. It is 107 meters high and crosses the river Wupper on the railway line between Wuppertal and Solingen. It is constructed by steel as an arched bridge, and was built between 1894 and 1897. It's a very impressive example of architecture. A beautiful 4-star hotel with modern rooms, a 24-hour reception and a spa area. It also includes a stylish restaurant in which also the breakfast is served. There is also car parking on site. In regards to the location, it is located just 1.5 KM from the Kölnmesse and the Lanxess Arena, a train connection is in imminent proximity, and the city center is a 10 minute drive distant. Located in a green part of Remscheid, this 4-star hotel offers modern accommodation, a charming bar and a games room, just 2 km away from the town centre. This recently renovated hotel is located in the town of Remscheid in the Bergisches Land region, opposite the main train station and only a 5-minute walk from the town centre.